Red lamps that are either constantly illuminated or turn on and off slowly in a cycle of a few seconds. Both types were in use in the United Kingdom until recently; however, new regulations stipulate the use of red lamps at nighttime only. Xenon flashers are therefore gradually being phased out. Traditionally, red lamps (or beacons) use incandescent filament bulbs. In order to improve the otherwise quite short lifespan, they are made with a ruggedised design and are run below normal operating power (under-running). A recent development has been the use of arrays of high-power red LEDs in place of incandescent bulbs, which has only been possible since the development of LEDs of sufficient brightness. LED-based lamps have a significantly longer lifespan than incandescent bulbs, thus reducing maintenance costs and increasing reliability. Several manufacturers have also developed medium-intensity white strobes based on LED technology to replace xenon. Xenon flashers, whilst more visually impressive, tend to require frequent replacement and so have become a less favoured option. However, with the advent of LEDs, white strobes are still somewhat desired. It is common to find structures with white xenon flashers/white strobes during the daytime, and red lights at night. Red lights are commonly found to be used in urban areas, since it is easier for pilots to spot them from above. White strobes (that flash round the clock) may also be used in urban areas. However, it has been recommended that flashing white strobes should not be used in densely populated areas; the lights usually merge with background lighting at nighttime, making it difficult for pilots to spot them and thereby aggravating the hazard. In addition, residents near the lit structure will complain of light trespass. In rural areas, red beacons/strobes may also be used during nighttime. However, white strobes are (sometimes) preferred since they reduce the maintenance cost (i.e. no maintenance of painting, no red side lights) and there are no background lights that would blend with the strobes. There are a medium-intensity white strobe and a high-intensity white strobe. Medium-intensity white strobes are usually used on structures that are between 200–500 feet (61-152.4 meters). If a medium white strobe is used on a structure greater than 500 feet (152.4 meters), the structure must be painted. The common medium white strobe flashes 40 times in a minute, at an intensity of 20,000 candelas for daytime/twilight, and 2,000 candelas at nighttime. A high-intensity white strobe light is used on structures that are taller than 700 feet (213.4 meters). These lights provide the highest visibility both day and night. Unlike a medium strobe, a high-intensity strobe does not provide 360˚ coverage; this requires the use of at least 3 high strobes at each level. On the other hand, it reduces maintenance costs (i.e. no painting). If the structure has an antenna at the top that is greater than 40 feet, a medium-intensity white strobe light must be placed above it rather than below. 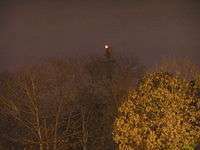 The common high white strobe flashes 40 times in a minute, at an intensity of 270,000 candelas for daytime, 20,000 candelas at twilight, and 2,000 candelas at nighttime. Dual lighting is a system in which a structure is equipped with white strobes for daytime use, and red lights for nighttime use. In urban areas, these are commonly preferred since it usually exempts a structure from the requirement of having to be painted. One advantage to the dual system is that when the uppermost red lights fail, the lighting switches onto its backup lighting system, which uses the white strobes (at its night intensity) for nighttime. 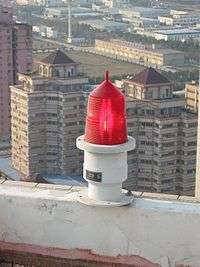 In the United States and Canada, red incandescent beacons are slowly being withdrawn from service and being replaced with red strobes or red LEDs. For high-tension power lines, the white strobes are equipped to flash 60 times per minute, using the same intensities as stated above. Unlike the common white strobes, these strobes are specified not to flash simultaneously. The FAA-mandated flash pattern is middle, top, and bottom to provide "a unique signal that pilots should interpret as a warning that catenary wires are in the vicinity of the lights." Aircraft use collision avoidance lighting systems to warn other aircraft of their presence. These lights include landing lights, red or white flashing beacons, wingtip strobes, and wingtip navigation lights. The wingtip navigation lights are required to consist of a red light on the left wingtip and a green light on the right wingtip. Landing lights are used during the descent and approach to landing, and at other times if deemed necessary by the flight crew or operator. These lights can generally be found attached to any tall structure such as broadcast masts and towers, water tanks located on high elevation, electricity pylons, chimneys, tall buildings, cranes and wind turbines. Shorter structures that are located close to airports may also require lighting; an example of such is the south scoreboard at Lambeau Field in Green Bay, Wisconsin built in 2013, which is the tallest structure in the general area of nearby Austin Straubel International Airport. The International Civil Aviation Organization (ICAO) sets standards, usually adopted worldwide, for the performance and characteristics of aviation warning lamps. Lights are usually arranged in clusters of two or more around the structure at specific heights on the tower. Frequently there will be a set at the top, and then one or more sets equally spaced down the structure. 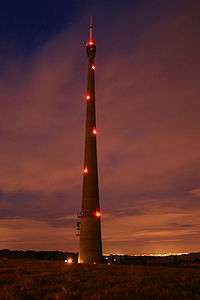 The United Kingdom's Belmont mast has nine clusters of red lamps spaced equally along the full height of the mast. 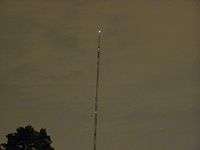 An antenna tower stands 446 feet (136 m) tall in Springfield, MO with its red and white aircraft warning paint clearly visible in the setting sun. On some tall structures there are or were non-standard aircraft warning lights installed. The mast of Deutschlandsender Herzberg/Elster had no aircraft warning lamps installed. It was instead lit by skybeamers mounted on small masts near the tower. This method was chosen as the mast was a mast radiator insulated against ground and for feeding the lamps on the mast otherwise special devices like Austin transformers would be required. Stuttgart TV Tower carries rotating lamps like used on lighthouses. Such lamps were also used on other towers in earlier days. Blosenbergturm in Beromünster has a rotating lamp above the cabin. In opposite to Stuttgart TV Tower it is less bright and only operated at dawn. The main masts of Mühlacker radio transmitter and the former Konstantynów Radio Mast also have aircraft warning lights at the outermost bases of their anchor guys. Conductor marking lights and Balisors are sometimes used for marking power lines. The Obstacle Collision Avoidance System allows the standard lights to remain off until an aircraft is within a given radius, allowing for a significant decrease in light pollution. The OCAS system also provides audio warnings. Aircraft warning paint usually consists of red and white paint at equal lengths on the antenna tower or mast. This paint scheme is usually required on towers over 200 feet tall, but may vary from state to state and near airports internationally. 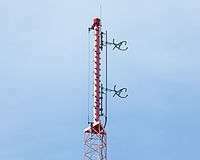 Because such a paint scheme is expensive to apply, antenna towers and masts are often built to heights just below the level of requirement. Antenna towers and masts often also have other aircraft warning features located at equal distances along their height and at their tops. These may include high powered strobe lights or LED lights in either red, white, or both colors in an alternating pattern. In such a case red is employed at night, while a white strobe is usually used during daylight hours. Warning lights on ground-based towers and buildings contribute to both light pollution and towerkill of birds.